Under the slogan “You are not alone – Standing up to settler violence”, Stop the Wall announces the program for this year’s mobilization to protect the olive harvest and Palestinian rights. This year, the olive harvesting takes place in a moment of dramatic escalation of settler and military violence against Palestinian farmers and villages, and on their lands. We are launching this year’s Olive Harvest Initiative with the heinous crime carried out by a group of settlers, who set on fire the home of the Dawabshah family, in Duma village, South-East of Nablus, still painfully alive in our lives. The settlers burned to death the toddler Ali Dawabshah while his father, Sa’ad, died of his wounds a few days after. His mother and his brother Ahmad (4 years old) have suffered serious injuries. In light of the daily increasing aggression against our people all across the West Bank, which goes hand in hand with the expansions of illegal settlements on our lands, no doubt settler attacks will be particularly brutal and frequent this year. We are expecting even more assaults on farmers while harvesting the olives, more trees uprooted or burned in order to prevent the farmers from harvesting their crops, even more incidents of settlers barring farmers from accessing their lands - all this with the connivance and support of the Israeli state and its military. For this reason, Stop the Wall, together with civil society organizations, movements, youth activists and volunteers, are planning this year’s Olive Harvest campaign with particular effort: only standing together will allow us to harvest our olives and to support the farmers, whose lands are most threatened. We therefore call on our friends and comrades from solidarity committees, organizations and individuals’ to participate in this campaign as volunteers. For more information, please use our contact form. 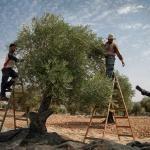 We will be organizing collective olive harvesting days across the West Bank. Areas will be chosen according to their closeness to the settlements, a history of repeated attacks in the villages and other risk factors. In the lands isolated behind the Apartheid Wall, we will work together with our people on the other side of the Green Line to organize joint activities and support farmers in those lands. The specific locations will be announced soon. The first phase will start on 01.10.2015 and last until 14.10.2015: It will consist of a series of voluntary activities aimed at preparing the fields for the olive harvest. It will be launched on October 1, in Duma (south of Nablus), the village where the settlers burned the family Dawabshah. The second phase will start on 15.10.2015 and last until 15.11.2015: It will support farmers in harvesting their olives in the areas particularly exposed to attacks by the settlers or closed by the Israeli military. On October 15, the opening activity will be held in Cremisan area, where land has been recently confiscated by Israel in order to continue construction of the Wall in Beit Jala, Bethlehem area. The third phase: We will plant olive trees in lands threatened by confiscation in various provinces in West Bank. Activities will start on November 16 in Qana Valley, Salfit district. Closing activity: The Olive Harvest campaign will end with the planting of 116 olive trees, as part of the campaign against the Jewish National Fund. This action will protest act against the role of the Jewish National Fund in the crimes committed by and financed by the fund against the Palestinian people since 1948. This year it will be 116 years since the foundation of this criminal organization.